Mari Vinson-Yildiz is a registered dietitian and has personal-training certification from the American Council on Exercise. She has been a freelance writer since 2010 and holds a M.S. in nutritional science from San Francisco State University. An apple a day keeps the doctor away, is a tried and true adage, particularly where lung cancer is concerned. Most fruits and vegetables are natural sources of antioxidants. These help prevent lung cancer and fight off cancer causing cells that have already developed in your lungs, and spread to other areas of your body. If you have lung cancer, consult your physician before starting a special diet. Apples contain a significant amount of antioxidants called flavanoids. These compounds can destroy cancer causing free radicals in your lungs. According to a 1999 study published in the "Journal of the National Cancer Institute," subjects who consumed apples on a regular basis, had a 60 percent lower risk of lung cancer, than subjects who did not. Cruciferous vegetables refers to veggies that contain cross like patterns across their top. Kale, watercress, broccoli, cauliflower, cabbage and collard greens are some of the most well known cruciferous vegetables. According to the Cancer Cure Foundation, these contain an antioxidant called lutein, which can decrease cancer risk. The Stanford Health Improvement Program states that these veggies are linked to lung cancer prevention, as well. Research compiled by the American Institute for Cancer Research in 2007, found evidence that beta carotene can reduce the risk of lung cancer. However, it also found that beta carotene supplements may increase lung cancer risk, particularly in smokers. It is important that your source of beta carotene come from food sources such as carrots, squash, sweet potatoes and dark leafy green veggies. 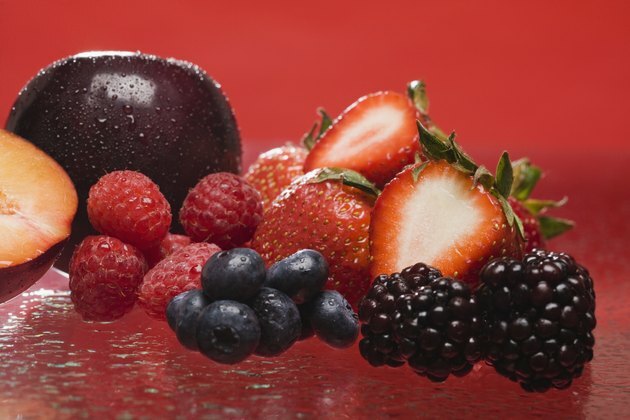 Most berries contain large amounts of antioxidants, the Stanford Health Improvement Program states that ellagic acid found in raspberries, helps prevent lung cancer, as well as breast, bladder and skin cancers. Ellagic acid can also hinder the reproduction of cancer cells. Also, it reports that the anthocyanosides found in blueberries are the most powerful known antioxidants and help prevent all forms of cancer.